French politician; born in Paris Aug. 19, 1851. After a classical and commercial education he prepared himself for the Ecole Polytechnique, but on the outbreak of the Franco-Prussian war left his studies to serve as a volunteer. In 1873 he became editor of "L'Avenir de la Sarthe," and served five months in prison for opposing the dictatorship of MacMahon. He afterward controlled "Le Libéral de la Vendée. In 1879 he became chief of the bureau of the financial under-secretary, and later represented the government at the Brussels Exhibition. Becoming editor of "La Lanterne" in 1882, he founded two years later "Le Matin." In Dec., 1882, he was chosen to represent the Gros-Caillon quarter in the Paris Municipal Council, and was reelected in 1884. Dreyfus in this position showed a remarkable aptitude for finance. In Oct., 1885, he was elected deputy by the department of the Seine, and was reelected, for the Twelfth District, in 1889. in opposition to a Boulangist candidate. A radical, with wide schemes of reform, Dreyfus sat with the Extreme Left. He was appointed a member of the army commission, and also on that of espionage. He has fought many duels, one with the late Marquis de Morès, the anti-Semite. His publications include: "Une Dictature" (Le Mans, 1874); "Giboyer à Saint-Pélagie" (Paris, 1875); "L'Evolution des Mondes et des Sociétés" (Paris, 1888); "Les Traités de Commerce" (Tours, 1879); "Le Tunnel du Simplon et les Intérâts Français" (Paris, 1879); "L'Angleterre, son Gouvernement, ses Institutions (Paris, 1881); "La Guerre Nécessaire, Réponse d'un Français à M. de Bismarck" (Paris, 1890). 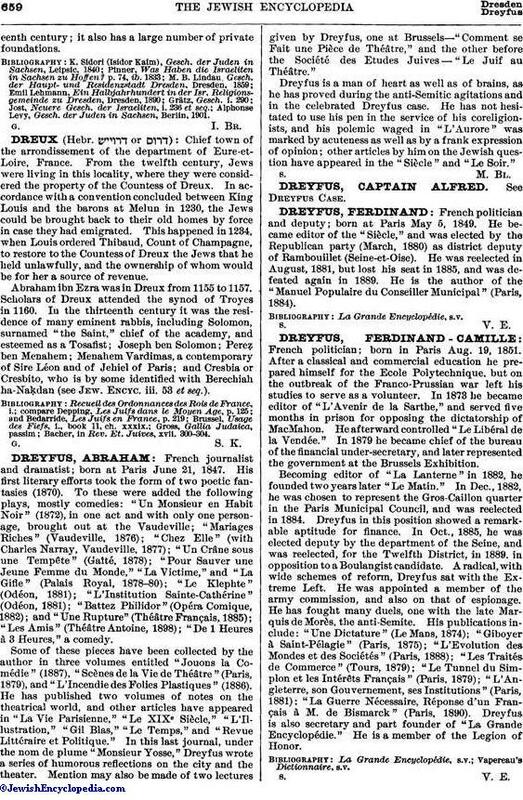 Dreyfus is also secretary and part founder of "La Grande Encyclopédie." He is a member of the Legion of Honor.